JOINT BASE PEARL HARBOR-HICKAM (August 4, 2016) – The world’s largest international maritime exercise concluded Aug. 4, after more than a month of training events conducted in and around the Hawaiian Islands and Southern California. Twenty-six nations, more than 40 ships and submarines, more than 200 aircraft and 25,000 personnel participated in Rim of the Pacific 2016, more countries and personnel than in any previous years. This year’s RIMPAC marked the 25th in the series that began in 1971 and is now held every two years. Hosted by U.S. Pacific Fleet, RIMPAC 2016 was led by U.S. Vice Adm. Nora Tyson, commander of the U.S. 3rd Fleet, who served as the combined task force commander. Royal Canadian Navy Rear Adm. Scott Bishop served as deputy commander of the CTF, and Japan Maritime Self-Defense Force Rear Adm. Koji Manabe was the vice commander. Other key leaders of the multinational force included Commodore Malcolm Wise of the Royal Australian Navy, who commanded the maritime component; Brig. Gen. Blaise Frawley of the Royal Canadian Air Force, who commanded the air component; and Royal New Zealand Navy Commodore James Gilmour, who led the amphibious task force. "RIMPAC 2016 was an unqualified success. The collaboration and cohesiveness between participants proved that we can operate effectively with our partner nations and that we will be ready in the Pacific if or when we're called upon,” said Tyson. “We operated as an effective team while simultaneously strengthening the skills of each and every participant. To safely and effectively execute an exercise of this scale and scope is a tribute to the leadership and skill of every participating unit. I could not be more proud of everyone who took part, and I value the friendships that we built." Tyson said the involvement of so many different countries working together to successfully accomplish RIMPAC was a strong reminder of the unity coalition forces can exhibit in a real-world situation. This year’s exercise participants were Australia, Brunei, Canada, Chile, Colombia, Denmark, France, Germany, India, Indonesia, Italy, Japan, Malaysia, Mexico, Netherlands, New Zealand, Norway, People’s Republic of China, Peru, the Republic of Korea, the Republic of the Philippines, Singapore, Thailand, Tonga, United Kingdom, in addition to the United States. The U.S., Australia and Canada have participated in all 25 RIMPACs since 1971. RIMPAC 2016 marked the first time Denmark, Germany and Italy participated in the maritime exercise. Each nation displayed capabilities ranging from disaster relief and maritime security operations to sea control and complex warfighting exercises, including a mass casualty drill, replenishments at sea, submarine search and rescue, aircraft refueling and multi-day diving operations. Additionally, a harpoon missile shoot from littoral combat ship USS Coronado (LCS 4) and amphibious operations in the Southern California area of operation were exhibited for the first time during a RIMPAC training scenario. Commodore Wise said this year’s exercise also had several real-world challenges that tested RIMPAC participants. 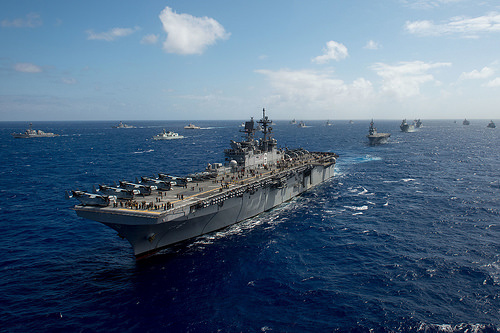 RIMPAC 2016’s theme of “capable, adaptive partners” highlights participating nations demonstrating the flexibility of maritime forces to meet regional and global challenges for mutual benefit. The world’s largest international maritime exercise, RIMPAC provides a unique training opportunity that helps participants foster and sustain the cooperative relationships that are critical to ensuring the safety of sea lanes and security on the world’s oceans. RIMPAC 2016 is the 25th exercise in the series that began in 1971. Despite Resolution, Kashmir Continues To Burn ! !